From our Unique Beaded Fringe Collection (trims under 1 1/2" long)We have found a fabulous trim (available in 3 colors) that we just know that you're going to love! The "Ivory Venetian" is crafted of beautifully facet cut soft ivory acrylic bead drop crystals suspended by sparkling gold seed beads and a matching ivory bead all hanging on a antique gold braided gimp. The overall effect is ornate and lavish. Also available in "Taupe Venetian" and "Amber Venetian". This is a high quality, very full beaded fringe with exceptional detail and craftsmanship. 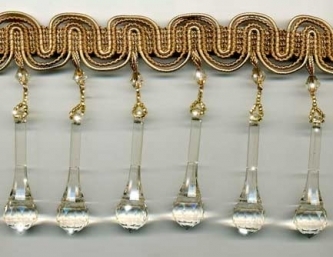 This beaded fringe trim is 4 " long including the braid strip. Perfect for your home decor.